A new Run Geordie Run t-shirt is now available to order for delivery starting in February. 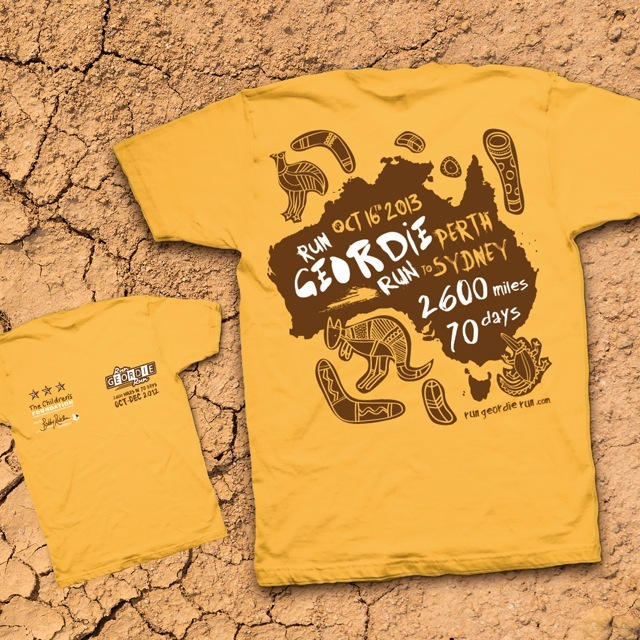 This latest snazzy design, created by my good friends at Shenton Creative, is of course Australia themed and features details of this year's 2600 mile run from Perth to Sydney. Due to the kind generosity of Benfield Motors paying for their production, all proceeds from the sale of these t-shirts will go to The Sir Bobby Robson Foundation and The Children's Foundation. As was the case with previous t-shirt sales nobody, other than the 2 charities, is making a penny from the sale of these t-shirts. Even local printing firm, Custom Planet, are doing the job at cost price. The new t-shirt design is shown below and it should be noted that the larger image is the back of the t-shirt. Unlike previous years there are 2 versions of this t-shirt; a traditional cotton one and a "technical" one for use while out running and in the gym etc. They are available in sizes small, medium, large and extra large. The cotton t-shirt is £10 with the technical t-shirt priced at £12. ALL T-SHIRTS ARE NOW SOLD OUT. Ironically, I'll be talking to ex Tyne Tees presenter, Andrew Friend, on the Breakfast show in Perth and then my old allies, Gary and Lisa, on Real Radio next week. 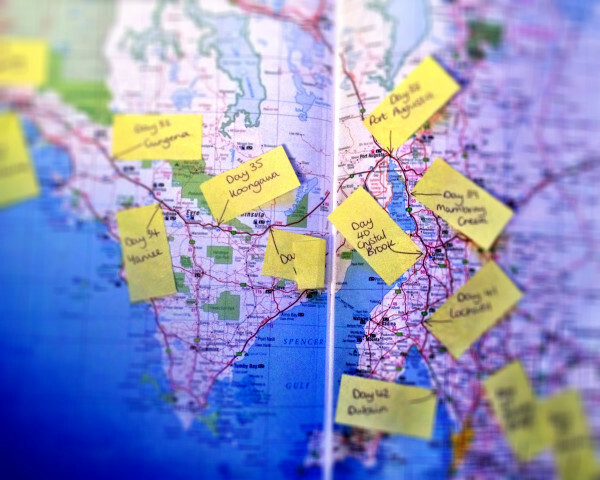 While much of the world was celebrating, I spent the majority of New Year's Eve finalising the Australia 2013 Support Team Rota and the plan for getting everyone safely to and from their respective parts of the route. It was an exercise that took a little over 3 hours to complete and the dates and arrangements were soon communicated to the team. 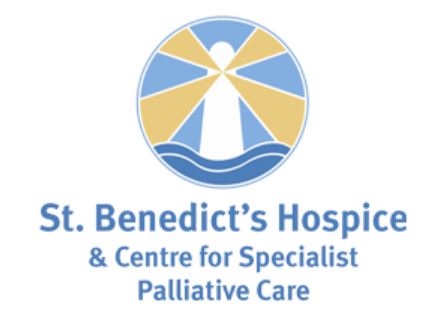 The groundwork has taken over 12 months to complete and this final task proved to be relatively straightforward. Now that I've informed the team of their respective start and end dates, hotels and flights can be thought about and booked. Also, I know that some of the team were keen to carry out their own research and become familiar with their part of the route. 12th October - Send off party in Perth. 27th October - Rest day 1 in Norseman. 451 miles in 11 days. 6th November - Rest day 2 in Mundrabilla. 820 miles in 21 days. 15th November - Rest day 3 in Ceduna. 1148 miles in 30 days. 18th November - Half way point east of Cungena. 1271 miles in 33 days. 23rd November - Rest day 4 in Port Augusta. 1435 miles in 38 days. 29th/30th November - Rest day 5/6 in Adelaide. 1642 miles in 44 days. 29th November - Celebration do for progress made to date in Adelaide. 11th December - Rest Day 7 in Hay. 2052 miles in 56 days. 23rd December - Arrive at Sydney Olympic Park. 2486 miles in 69 days. 24th December - Run up and over Sydney Harbour Bridge. 24th December - Mass 10k run from Sydney Harbour Bridge to the finish line at Bondi Beach. 2506 miles in 70 days. 24th December - Tune in to Gary and Lisa on Real Radio at 0730 (GMT) on the Christmas Eve edition of their Breakfast Show. It's been 13 months since the announcement of the run across Australia. I can at last say that "I will be running across Australia this year!". Only 288 days until the start on 16th October 2013!